People may have forgotten about the nomination of Supreme Court Justice Neil Gorsuch that occurred only months ago, but they will probably not be able to forget his influence on the Court years from now, according to experts at a Constitution Day Panel discussion in September. Gorsuch, one of the youngest appointed Supreme Court justices at the age of 49, was the primary focus of the event, which was hosted by BYU’s Law School as part of events around the country held to commemorate the signing of the Constitution of the United States in 1787. At the panel, undergraduates, law students, and experienced lawyers and attorneys alike came together to hear BYU professors discuss Justice Gorsuch’s past influences and opinions and how they might affect his decisions as a Supreme Court Justice. In the panel, Professor John Fee stated that he would expect Justice Gorsuch to act similarly to Justice Scalia in regards to property rights. Based at Gorsuch’s comments in an email concerning the Kilo v. New London case in 2005, in which the Court held that the general benefits a community enjoyed from economic growth qualified private redevelopment plans as a permissible “public use,” the Justice is a strong defendant of property rights and holds true to his value of the plain, textual meaning of the Constitution. Professor Aaron Nielson noted that looking back on Chief Justice Roger’s strong dissension in Arlington v. FCC, future Supreme Court action will likely occur regarding administrative law. As a Westerner and a past judge in the US Court of Appeals 10th Circuit, Gorsuch has a very diverse cultural perspective and familiarity with Indian law. While he has not participated in all aspects of Indian law, the 10th Circuit oversees a region with a large number of tribes and Gorsuch has written ten opinions on cases regarding these matters. These opinions include a mix of winning and losing opinions, but the National Congress of American Indians openly supported Gorsuch’s nomination. 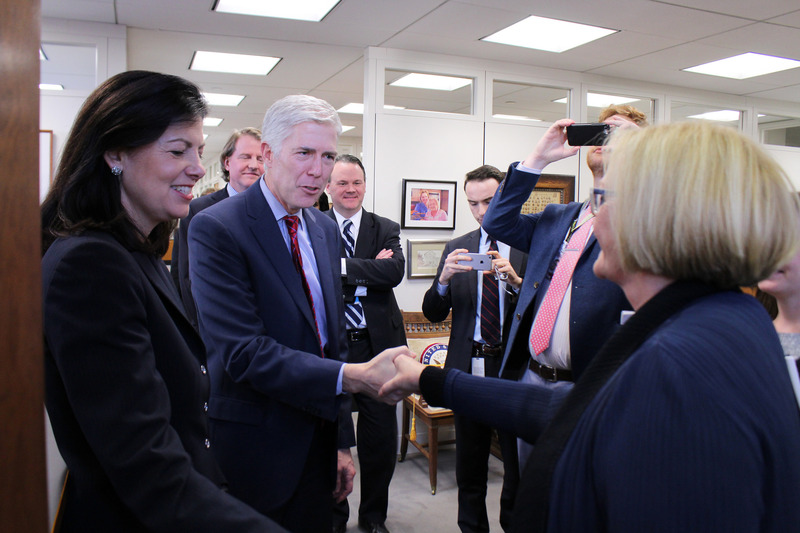 Gorsuch has a clear understanding of the legal status of tribes and the need to define Indian country, an understanding that will shape his court decisions. While Professor Elizabeth Clark emphasized that religious law is a very case-by-case field, we have a general understanding for Justice Gorsuch’s approach to religious law through his experience and case judgments in the 10th Circuit. Gorsuch tends to look to history for interpretations regarding religious law. In the past, he has also tended to be more comfortable with public religious expression. In concerns to statutory protections of religious freedom, he tends to look at both the spirit and the letter of the law, a value he’s shown through his review of prisoner cases and allowing prisoners to keep their religious rights. Gorsuch also recognizes sincere religious beliefs and strives to be a consensus builder within the court. Justice Gorsuch has the potential for a very long Supreme Court record. While BYU professors have given their best predictions on his Supreme Court action, only time will tell the impact Neil Gorsuch will have on the Supreme Court and national law. The good thing is that while Gorsuch may not write with Justice Scalia’s humor, he explains situations and writes his opinions in a very understandable and accessible way, facilitating the process of understanding Constitutional rights for all United States citizens. Previous PostStudent News: The BYU Farmers’ Market and How it Creates CommunityNext PostMoms Monitoring Media: Does it Help?